Disclosure: This post contains affiliate links. This means I may make a small commission if you purchase something, and doesn’t change your purchase in any way.Disclosure: This post contains affiliate links. This means I may make a small commission if you purchase something, and doesn’t change your purchase in any way. You’re right, the Earth is mostly covered by water (about 71%) but 96.5% of that water is salt water which is unusable unless is goes through some serious processing. So, where does the water you use in your home come from? That’s easy – the faucet, right?! I did get that answer from my son! 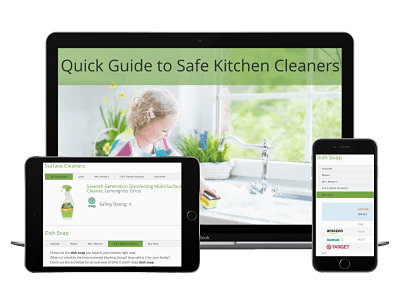 The real answer – which I was sure to share with him – is that all of the water we use in our homes comes from a groundwater source, such as a well, or from a surface-water source, such a river, lake, or reservoir. This water along with water from our seas, oceans and bays is constantly moving through the water cycle of evaporation and precipitation. Our earth’s water supply is not limitless so it’s vital that we do our part to conserve it and keep it clean. As you can see, there are some pretty big water hogs in our homes, especially the bathroom! To help your family cut down a bit on how much water you use in there, here are 5 no brainer ways to help your famlly use less water in the bathroom! I’ve also learned that getting some sort of middle man in there also works. It may take a little longer to achieve the desired outcome but it keeps the peace. 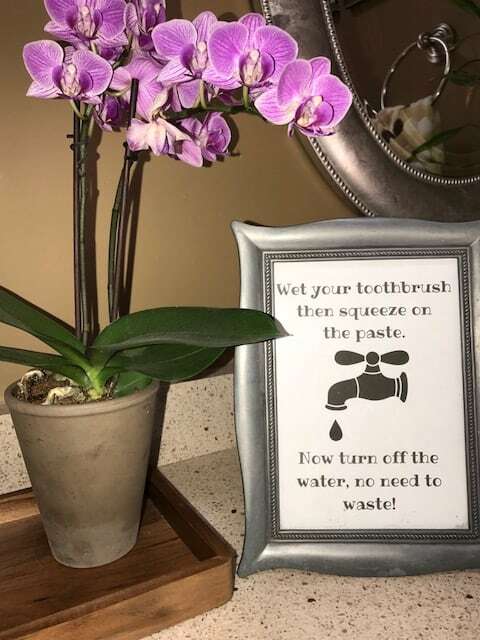 In the bathroom, it can be really helpful to create your own signs to post in the bathroom with a simple reminder to use less water. 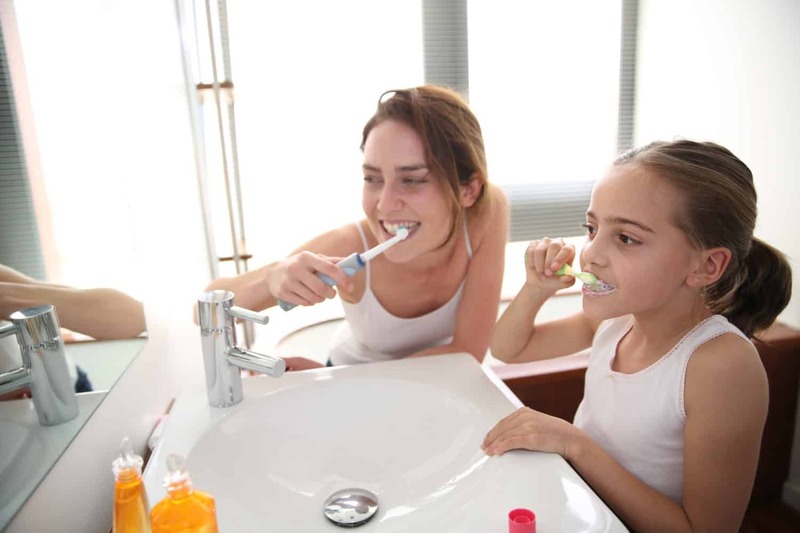 A specific action is best, like a reminder to turn off the water while brushing your teeth. Once you have your reminder message created, try framing it in a nice frame that goes with your bathroom decor. I guarantee after seeing that reminder sign day after day, your family will start to pick up the habit and little by little start turning off that faucet!! Just like the reminder signs posted in your bathroom, it’s really easy to grab some window markers and post your water saving messages on the mirrors. The kids can help with this – ’cause what kid doesn’t like writing on walls and furniture! Let them have at it as long as they are getting the right messages up there. They can use different colors, draw pictures – really anything that gets the message front and center – and all without you nagging them. Perfect! 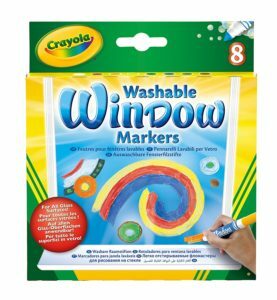 The great thing about using window markers is that you can change the message, the colors and pictures whenever they seem like their effectiveness is wearing off. You know how sometimes you see something so often that you don’t even see it anymore? What better place to stick a reminder about turning off the water while brushing your teeth than on the tube of toothpaste itself?! A simple message attached to your toothpaste tube serves as a reminder every time your family picks it up to squeeze it! And even if they don’t actually read the message every time they will still associate the sticker – which they WILL see – with the reminder to turn off the water while brusing! A post-it note would work but I’ve also created these FREE downloadable stickers for you! Give them a try and let me know how they work! FREE Toothpaste Tube Sticker Reminders! 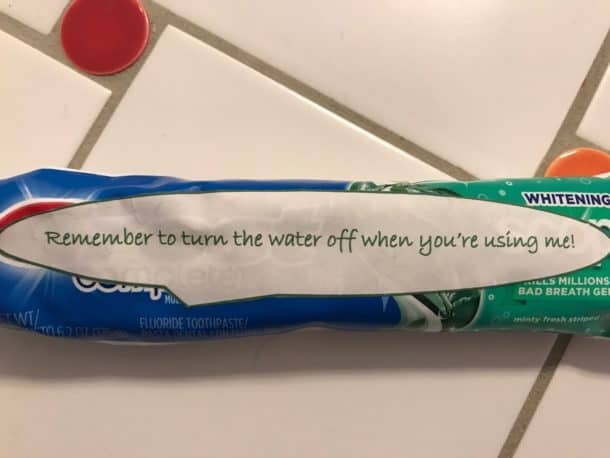 These toothpaste tube stickers help your family remember to turn off the water while they brush their teeth and use less water! Since showering uses up about 17% of an average family’s daily water use it makes sense to try to use less water here too. I have done some serious yelling and banging on doors to try to get my 14 year old daughter out of the shower. Half the time she isn’t actually even in the shower while it’s running. Ugh!!! LIke I said before, the nagging and fighting about water use works (usually) but it’s not fun. What’s a lot more fun is to get your family to take showers while listenting to music. Have them pick 2-3 songs each day and ask them to finsh up in the shower by the time songs are over. You can even turn the into a little friendly competition! Maybe the shortest average shower time for the week gets a trip for ice cream or a fun treat? Find out what motivates each family member then dangle that out there! Flushing your toilet uses up almost 27% of your daily water use. And, on average, each person flushes the toilet about 5 times per day. Even if you have a low-flow model toilet (1.6 gallons/flush) you are each using close to 10 gallons a day. Instead, you CAN ask them to flush the toilet less frequently. What?? I have to say, the girls in our house are a teeny bit grossed out by this. They are even more grossed out by stepping foot into their brother’s bathroom – and for good reason! Just give the idea some thought and give it a try. It may be that some family members are more willing than others and that’s okay. Even a few less flushes makes a difference in the big picture. 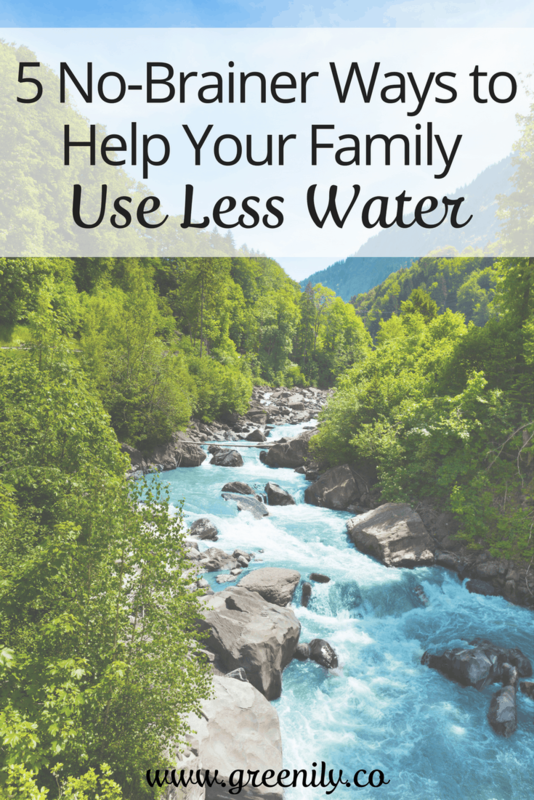 So there you have it – 5 no brainer ways to help your family use less water! Not so bad, huh? None of them are life altering or lifestyle changing tasks. Each is just a teeny step that helps make changing habits a little easier. I hope you’ll give them a try!